If you've never been to Postsecret it's a great site where viewers submit their own secrets for all to see. This week the above postcard was shown. 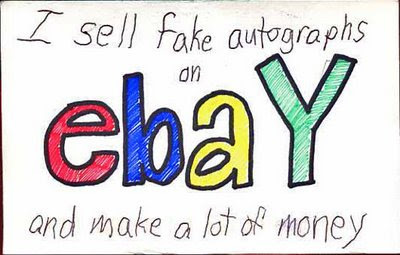 Unfortunately, it highlights a dirty secret active collectors know about eBay. Fakes are everywhere. This postcards is a useful warning for anybody using eBay. There are a lot of hucksters there so be careful. Whether it's a signed photo or a antique chair always be aware of possible fakes. My only advice is to do your research, ask for a Certificate of Authenticity from a valid authenticator when appropriate and buy from who you trust.